This post is, Three Simple DIY Dinner Party Ideas, sponsored by BeFunky. All opinions are 100% my own. Ever since we moved into this house, we have enough room to entertain. One of my favorite things to do is to throw intimate dinner parties with a few great friends. It’s a nice way to spend quality time together without the kids and catch up on all our busy lives. To make these dinner parties extra special, I like to go the extra mile and send out a proper invitation, prepare a great menu, and have a beautiful place setting. It doesn’t take too much time to throw your own DIY dinner party, and it adds a classy and personal touch to such an intimate gathering. BeFunky.com is a Photo Editing Platform with a creative toolset for photo editing and collage making. It’s the perfect tool to use for a DIY dinner party like this. There are templates for everything you need including, invitations, cards, and thank you notes. In just minutes I made this beautiful invitation to send to my guests. 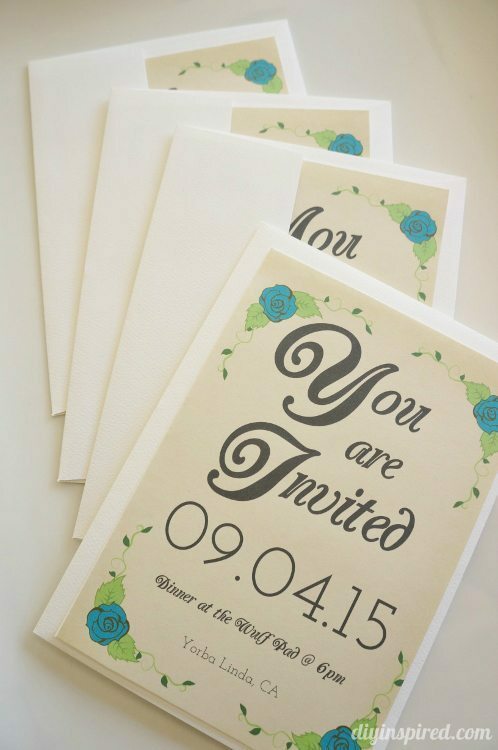 I chose a Save the Date template available on BeFunky and changed it to “You are invited”. 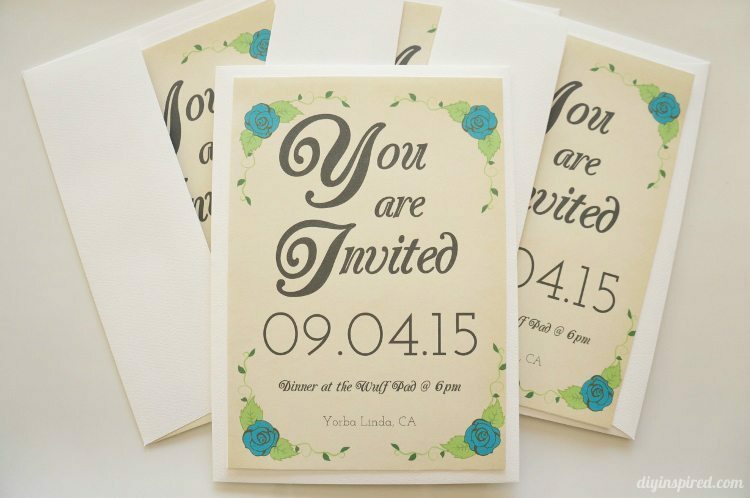 Print them out and send them off and your guests will think you had them custom made. 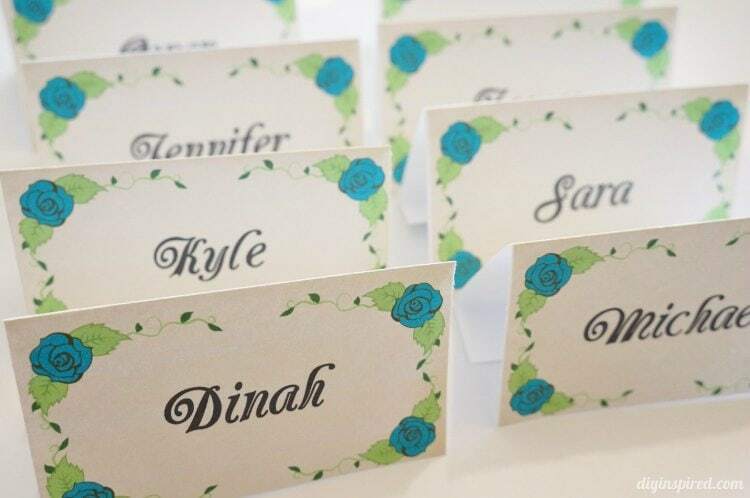 Place cards are such a great way to dress up your table. 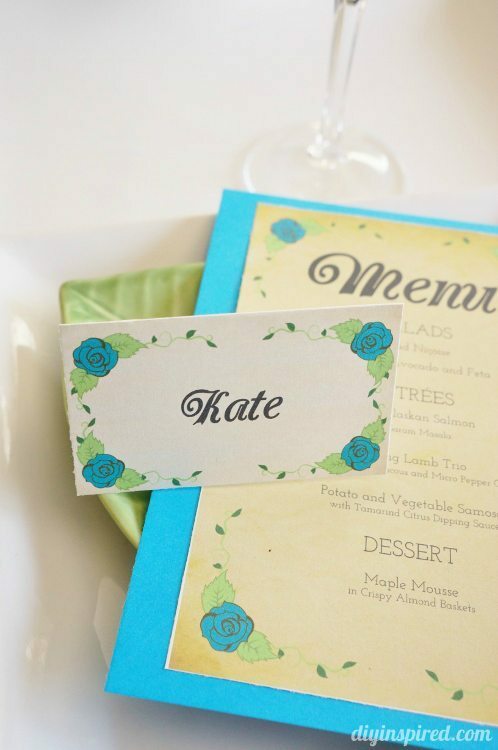 It’s a simple way to personalize each setting and make your guests feel special. I used a BeFunky Thank You card template to make these name cards. I printed four on one sheet of 8.5” X 11” paper and cut them out. To make the place cards in the Designer, click on “Event Graphics”, then “Thank You Cards”. Choose the template you would like to use. 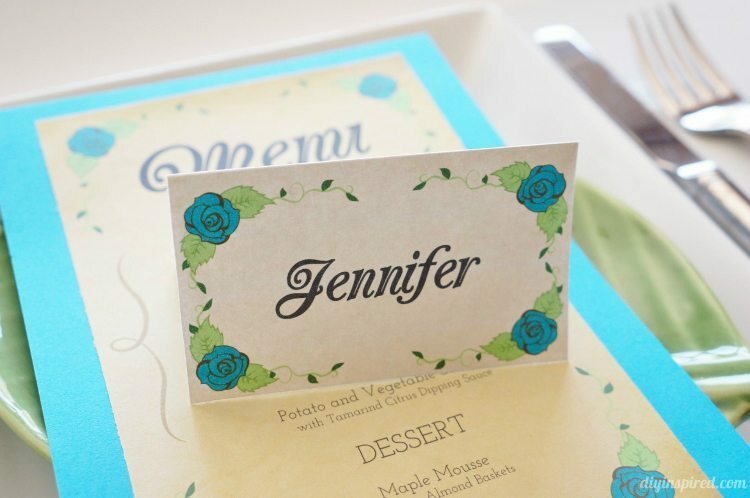 Highlight the text and change it to your guest’s name. Print them out and fold! 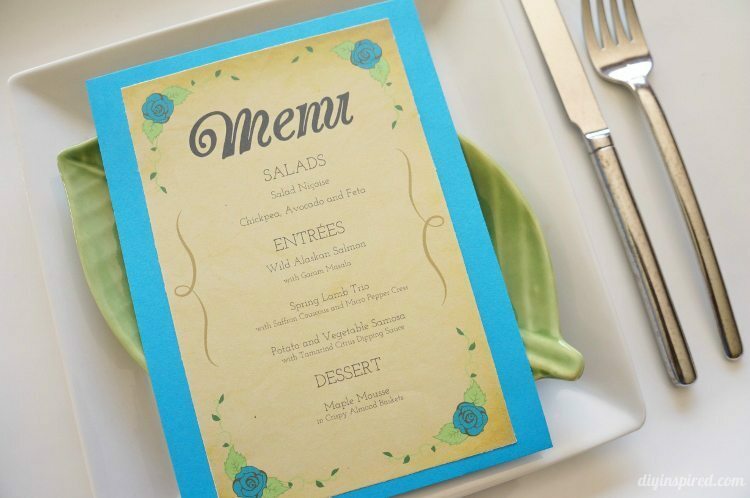 Menus aren’t just for weddings! 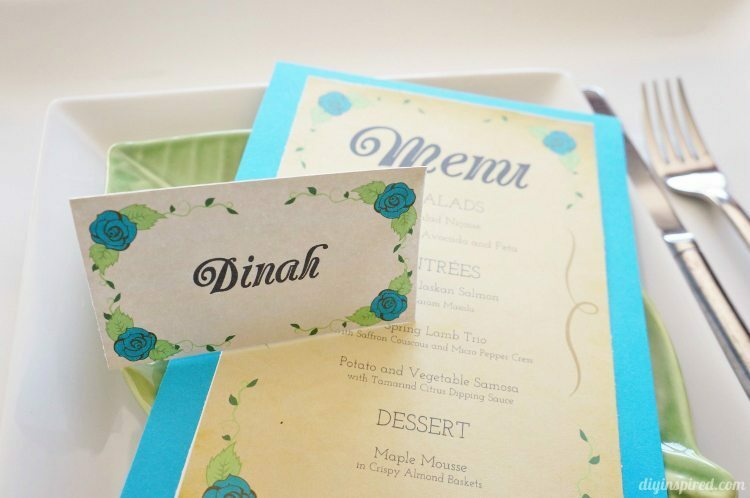 I printed out these menus using a matching template to the invites and place card holders. 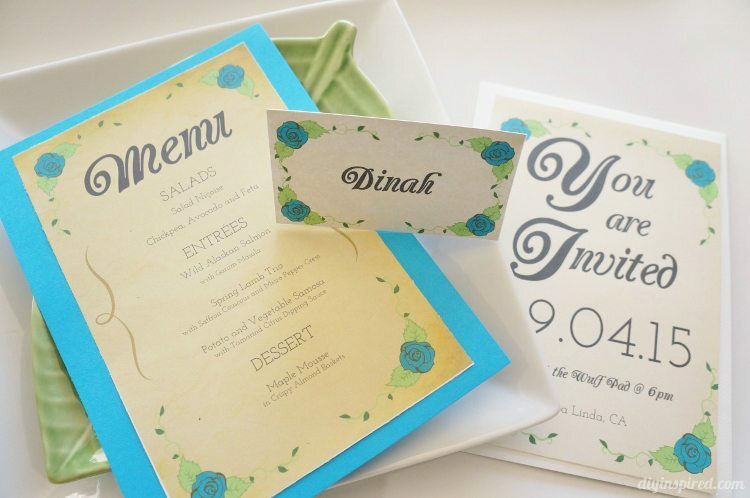 I glued them onto blue paper to add a pop of color to table. BeFunky is perfect for professional/amateur photographers, freelancers, bloggers, Etsy shop owners, and students. BeFunky features an easy-to-use collage maker and photo editing app, so the DIY projects are limitless. You can use it for weddings, decorative projects at home, crafts for kids, and party decorations. There are also social media templates in the correct size to design your own Etsy, Facebook, Twitter, and Pinterest header and graphics. One of my favorite features is the photo editor. You can improve or get creative with your photos in just a few clicks. The new Designer Toolset just launched so these tools are the latest and greatest. The Designer is integrated with the photo editor so that you can just open a photo easily in the editor while you work on it in the Designer. The Designer is also fully integrated with Pixabay, a free online stock photo library, which is huge! This means when you go to the “image manager” tab, you can either upload your own photos, upload from your BeFunky profile, or search for photos from Pixabay’s extensive library from within the app. I hope you liked these three simple DIY dinner party ideas! You can make all three in less than an hour and it will make such a big impact and add a special touch to your next get together. Oh wow, I love these! That’s way more fun and personalized than just simply inviting someone over for dinner! Thanks, T! You know me… a little extra crafty something is ALWAYS better! Ha! 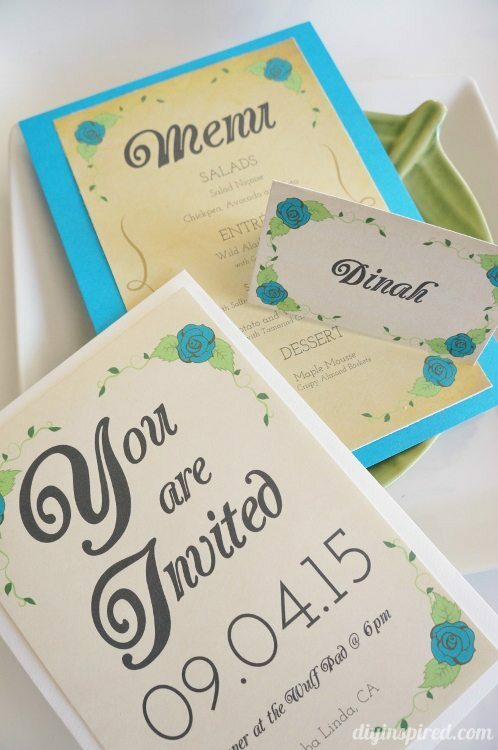 These are so pretty Dinah – love the floral look! I’ll be making these for our next dinner party 🙂 Love these BeFunky graphics! Thanks, Heather! You have to check out the design tool. Lots of cool stuff, especially for Bloggers like us! Just gorgeous Dinah! I love everything about these. Thank you so much, Malia!